Aug 20, 2010 - There was a sigh of relief at the Pentagon Wednesday as the U.S. Army's final combat brigade crossed from Iraq into Kuwait. Generals and their staffs have spent nearly a decade juggling soldiers to meet the needs of two wars, bruising many of the units and stretching the Army nearly to the breaking point in the process. Military experts agree that reducing troop strength in Iraq will ease the strain on the force, although it could allow tensions inside Iraq to flare. But the campaign's sunk costs — more than 4,400 U.S. troops dead, 30,000 wounded (and far higher Iraqi casualties), along with a price tag that amounts to $2,500 for every person in America — is far higher than anyone expected when Operation Iraqi Freedom began on March 20, 2003. 1. Training Iraq's security forces, now 660,000 strong. 2. Providing intelligence, aircraft and other assets to support Iraq's counterterror campaign. 3. Protecting U.S. and allied civilian agencies as they continue to try to rebuild a shattered country that is still trying to put together a government five months after an election. The heart of the remaining U.S. force, while labeled "advise-and-assist brigades," has combat power that far outstrips that of the Iraqi military, and which could be deployed if Baghdad sought U.S. help and President Obama agreed. General Ray Odierno, who has just finished a tour as the top U.S. commander in Iraq, said the remaining U.S. troops and their Iraqi allies can handle anything insurgents can throw at them. "I get a little frustrated because people think, 'Well, you're going to 50,000,'" Odierno said recently. "Fifty thousand U.S. soldiers is a lot — it's a lot of capacity and capability." Odierno, who has spent 55 months on three deployments commanding U.S. troops in Iraq, believes the Iraqi people are tired of fighting. "My personal opinion is that Iraqis went through a significant amount of obviously sectarian violence and almost civil war in 2006 [and] the beginning of 2007," he said. "My read is most of them are beyond that." Some 2,400 U.S. government civilians will continue to work in Iraq, protected by at least twice as many private contractors once the U.S. troops pull out entirely. They'll travel around Iraq in 60 mine-resistant ambush-protected vehicles, hundreds of armored cars and a fleet of airplanes and helicopters. The cost of operations in Iraq has fallen sharply, from a peak of $11 billion a month in 2008 to less than half that figure now — and it is slated to drop to about $4 billion a month next year. The State Department will spend a further $4 billion for all of 2010 in Iraq, and a similar amount next year. Christopher Hill, who just left his post as U.S. ambassador in Baghdad, said Tuesday in Washington that something fundamental has changed in Iraq. "When you go out outside of the Green Zone and you see plate-glass window being installed in Iraqi shops," he said, "you realize it's because the sense of insecurity that prevailed there a couple of years ago has been changed." Not everyone is so optimistic. "The Iraq war is not over and it is not won," Anthony Cordesman of the Center for International and Strategic Studies warned Thursday. He expects it could take another decade for Iraq to become stable, and fears the U.S. government may not adequately fund the struggling government it helped create. "Iraq still faces a serious insurgency, and deep ethnic and sectarian tensions," he said. "In spite of its potential oil wealth, its economy is one of the poorest in the world." The focus of the U.S. presence in Iraq will become the Baghdad embassy — Washington's largest anywhere — and consulates (think of them as mini-embassies) in the southern city of Basra and the northern city of Arbil. The State Department also plans to establish what it's calling two embassy "branch offices" in the north, in Kirkuk and Mosul, to deal with tensions there created by the Arab-Kurd contest for control. Unlike permanent consulates, those are expected to operate for no more than five years. 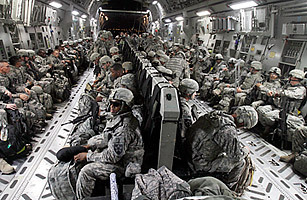 General George Casey, the Army Chief of Staff, recently pondered how his service has been able to survive the demands of two ground wars for nearly a decade, which gave many soldiers only a year at home between yearlong combat tours. "If you had asked me five years ago could we as an Army sustain one year in combat, one year home, for five years, I would have said you're nuts." But Casey credits the courage and patriotism of today's young soldiers and their families, and the support of the U.S. public, for the Army's endurance. "Don't underestimate this generation of young Americans," he said, "and what they're capable of doing."